Football League 2013-14: Who would be a manager? A new Football League season is about to start, but just how many managers who begin the 2013-14 campaign will still be employed next May? There were 52 managerial changes in the Football League between 1 July 2012 and 30 June 2013, of which 34 were dismissals. "Recent figures are alarming as, including the Premier League, more than half of the 92 clubs now have a different manager to who started last season," League Managers' Association chief executive Richard Bevan told BBC Sport. On the eve of the 2013-14 Football League season, BBC Sport explores the precarious nature of the job and speaks to two managers at different ends of the managerial ladder - one just starting out and the other well established. Figures compiled by the LMA show that more than 100 managers and coaches were dismissed across the Premier League and Football League last season. There were 21 changes [compared to nine in 2011-12] in the Championship, of which 13 were sackings and eight resignations. Blackburn got rid of three managers during the 2012-13 campaign - Steve Kean, Henning Berg and Michael Appleton. There were 13 managerial changes in League One and 18 in League Two, compared to 11 and 10 respectively. The average tenure of a League One manager last season was just 1.64 years and it was 2.25 in League Two. Eight who lost their jobs at Football League clubs were in their first managerial roles at that level - Sean Dyche (Watford), Kean (Blackburn), Andy Thorn (Coventry), Paul Dickov (Oldham), Gary Smith (Stevenage), Carl Fletcher (Plymouth), Dean Holdsworth (Aldershot) and Micky Mellon (Fleetwood). Former England striker James Beattie, 35, is embarking on his first season as a manager after being appointed boss of Accrington Stanley in League Two. "The days when chairmen and boards are loyal to managers are rare," the former £6m Everton striker said. "It's a cut-throat world, it's all about money. "There's a little bit of a culture coming in and it seems to be the done thing [to change managers too quickly]. I've heard people talk about introducing a specific window to change managers, like transfer windows for players, but I don't think that's possible. "Decisions like that are made by the board - they're in charge. But I'm not concerned because I have always believed in my own ability. "I spoke to my family and a lot of my friends in football before I took this job. It was a big decision. I texted [Manchester United manager] David Moyes, who was my manager at Everton, and I'll be speaking to [Scotland boss] Gordon Strachan, who was my manager at Southampton. "Accrington Stanley is really tight-knit behind the scenes and it's not a club that has a habit of sacking managers regularly." Exeter City's Paul Tisdale is the longest-serving manager in the Football League. Since being appointed in June 2006, there have been almost 300 managerial changes in the Football League. Nine managers have left Queens Park Rangers since Paul Tisdale [pictured] was appointed manager of Exeter City in June 2006 - Gary Waddock, John Gregory, Luigi de Canio, Iain Dowie, Paulo Sousa, Jim Magilton, Paul Hart, Neil Warnock and Mark Hughes. "Three hundred managerial changes since my appointment does seem a lot, but I'm not surprised because of the way that we are," former Southampton midfielder Tisdale said. "Every Saturday we get too up if we've won and too down if we've lost - there's nothing in between. People demand instant success. "My advice to anyone thinking about entering management is be careful where you choose to work. "I chose my club when I entered management. The previous two managers at Exeter weren't sacked - they moved of their own accord. There hasn't been a sacking at Exeter for more than 10 years. "I've had opportunities to move on. I do think I will go on to reach the higher levels of the game. It might happen soon or it might take a long time, but when it happens I will have more to look back on. "My advice to players thinking of becoming managers is don't be put off. It's a fantastic way of earning a living. It's exciting, very hard work and you have to have a thick skin. I love doing it." Richard Bevan is the chief executive of the LMA, the body that represents the views and interests of managers in England. "Since I joined the LMA in January 2008, there have been more than 250 managerial movements [in all four divisions] and more than 30% of the dismissals are with managers given less than one year in the job. "Looking at the facts from last season, the figures published highlight the ongoing deep concerns in management, when you consider that it produced a record number of managerial movements across all four leagues. Some Football League managerial changes were more successful than others last season. . .
Bournemouth parted company with Paul Groves on 3 October with the club languishing 20th in League One. The Cherries went on to win automatic promotion to the Championship under Eddie Howe. League Two Bristol Rovers were 23rd and fighting for their Football League lives when they got rid of Mark McGhee on 15 December. They eventually finished 14th under John Ward. Barnsley sacked Keith Hill on 29 December with the club bottom of the Championship and four points from safety. David Flitcroft took over and guided them to safety. Blackburn Rovers were third in the Championship table when Steve Kean was "forced to resign" in September. They finished 17th. Staying in Lancashire, Micky Mellon had steered League Two Fleetwood into play-off contention when he was sacked in December. They finished 13th. League Two Southend United went from ninth to 11th after parting company with Paul Sturrock in March. "As we embark on a new season, only two of the 92 professional football clubs have managers who have served for more than five years at their respective clubs - Arsene Wenger at Arsenal and Exeter's Paul Tisdale. "Tenures remain extremely low and when you also examine the level of coach dismissals, in the space of 12 months, more than 100 managers and coaches have lost their jobs. "It might sound simplistic but if a vacancy exists, clubs should examine their business model and their manager recruitment strategy. "They must then take the time to recruit the appropriate manager for the job, one who shares and can deliver the club's vision. Looking at the current stats they would suggest that this extremely important process, the recruitment stage itself, is perhaps not thorough enough. "However, what remains vital is that the clubs themselves recognise the important role they play in developing our future leaders. "Unfortunately the current approach for the majority of clubs, and what is verified in the stats, is that they are preventing a manager's personal development by placing such an excessive focus on short-term results. "What remains key is as our young coaches look to make the transition from a coach into a manager, they need to have the confidence that they can develop into the role and build for the future. "The current and consistent volatility in management continues to undermine the profession at a time when the game needs to continue to encourage players towards the end of their career to stay in football. "Last season's dismissals have once again highlighted the importance of developing strong relationships at a football club between the manager, chairman and directors." Charles Ross was editor of former Wolverhampton Wanderers fanzine A Load Of Bull. He claims the club hasn't recovered from the 'catastrophic' sacking of Mick McCarthy in February 2012. "We need to end this madness [of getting rid of managers]. "Since Mick McCarthy left 18 months ago we've had Terry Connor, Stale Solbakken, Dean Saunders and now Kenny Jackett. "Getting rid of McCarthy has set us back years and we are where we are entirely on merit. "The timing of McCarthy's departure was catastrophic. Jez Moxey [chief executive] said that the job was not for a novice and then appointed Terry Connor who had little managerial experience. 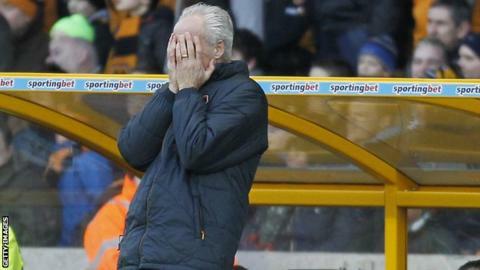 "It's going to be a long hard road back and they need to give new boss Kenny Jackett time. Wolves are still on the way down and don't know where the bottom is yet." There will be regular Football League Friday features on the BBC website throughout the season.